An illegal border crossing. A fake marriage. A mad German count determined to create an army of unbreakable soldiers. Lady Olivia is not all she seems. Trained for marriage to an assigned political target, her skills lie in programming household steambots to serve tea, dress her hair… and sound the alarm while she picks locks and listens at doors. Humiliated by a failed assignment, she decides to redeem herself by tailing a suspected double agent. Lord Rathsburn must flirt with treason. Struggles to cure a horrible disease have met with unexpected complications. The cells he engineered can make a man’s bones unbreakable, but the side effects are fatal. He believed the research terminated… until his sister was kidnapped by a German count. Her ransom? A cure. Piloting a stolen dirigible, he uncovers an unlikely stowaway, Lady Olivia. Arriving together at a crumbling castle, an impossible task is set before them: cure the count’s guardsmen. 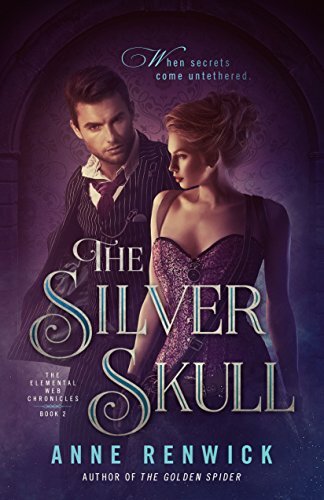 Amidst their fake marriage, a very real growing attraction, dying guardsmen and escalating hostilities, Lady Olivia and Lord Rathsburn are thrust deep into the world of international medical espionage from which there may be no return. In the beginning I was quite sad because I expected that the Elemental Web Chronicles would continue on with Thornton and Amanda, and that they would continue solving crimes and working for the Queen. Once I got over that and gave Olivia a chance, I came to find the story quite amusing and enjoyed it. Although I understand that Olivia’s abilities and intelligence were supposed to be suspect in The Golden Spider, I found it hard to believe the complete change in mentality that her mother was now shown/said to have. Although some characteristics of Olivia’s remained the same, the difference in her in this compared to how she was in The Golden Spider was at times hard to fathom. Treating this like a completely different novel, not necessarily one that should have flowed from one book to the next, made the changes easier to accept. I quite liked Lord Rathsburn. He was gruff and not the greatest at dealing with people, much like the scientists I know. His familial loyalty was endearing, as was his sense of honour. I did enjoy this novel quite a bit, though not as much as The Golden Spider.